The Yankees beat the Boston Red Sox, 13-3, on Tuesday in the first game of their series. This was the fourth time in seven games that they have scored in double figures and their offense has scored 68 runs in those seven games. As a result of the Toronto Blue Jays win last night, the Yankees have a 5.5 game lead over Toronto for first place in the AL East and they have a 6.5 game lead over the Baltimore Orioles. The Blue Jays have won three games in a row and the Yankees will play an important three-game series against them this weekend. The game was still close as the Yankees were winning 4-3 going into the bottom of the seventh inning, but the Yankees then used a nine-run outburst in the bottom of the seventh to give them a 13-3 lead. Alex Rodriguez hit a single to center to drive in Jacoby Ellsbury and then Brian McCann hit a homer above the Fox Business sign in the second deck in right field to send Chris Young and Rodriguez home to make the score 8-3. Chase Headley hit an RBI double to left to make the score 9-3. Ellsbury singled to left to score Headley and then Chris Young blasted a three-run homer to left field. That was his 13th homer of the season after hitting 11 all of last season. Young had a great all around game as he caught three fly balls in left field, was 3-4, had three RBIs and scored four runs. The Yankees were an outstanding 8-15 with runners in scoring position and Mark Teixeira, Young, Rodriguez, McCann and Headley all had multi-hit games. McCann hit his 18th homer and drove in his 65th run of the season and is on pace to easily improve on his power numbers from his first season with the Yankees in 2014 when he hit 23 homers and drove in 75 runs. Masahiro Tanaka had a quality start as he allowed three earned runs in six innings, but his performance was not similar to when he pitched like an ace earlier this season and last season. He was taken out of the game after allowing a homer to leadoff the seventh inning to Pablo Sandoval. Tanaka picked up his eighth win of the season, but he has now allowed three runs or more in seven of his last eight starts. Tanaka has allowed four, five and six runs in three of those starts and has been hurt by the home run since the opposition has hit multiple homers against him in four of his last eight starts. His ERA has risen from 2.49 on June 15 to 3.84 on August 4. Before the game against the Red Sox, infielder/outfielder Dustin Ackley, who was acquired in a trade with the Seattle Mariners on July 30, was put on the 15-day disabled list because of a strain in his lower back. Ackley only had three at-bats with the Yankees before being put on the DL. Yankees GM Brian Cashman thinks that Ackley will be out a minimum of 20-30 days. Ackley has a herniated disk and the Yankees replaced him on the roster with relief pitcher Caleb Cotham. He was not injured when the Yankees traded for him. He took an epidural with the hope that it will solve his lumbar problem so that he can return to the roster at the end of the month. The Yankees routed the Texas Rangers 21-5 at Globe Life Park on Tuesday for their fourth win in a row and eighth win in their last nine games. Yankees starter Chris Capuano allowed five run in the first inning and then the Yankees went onto score 21 unanswered runs. According to the Elias Sports Bureau, the Yankees are the first team to score 21 unanswered runs after allowing five or more runs. The Yankees scored 11 runs in the second inning and then four runs in the third to essentially put the game away. Even more rare is that Capuano allowed three hits, five walks and five runs while getting two outs (it took 29 minutes) in the first and then the Yankees didn’t allow a hit the rest of the game. “I don’t know if I have been a part of that where you give up five runs in the first and then don’t give up another hit the rest of the game,” Joe Girardi said. The Yankees were led by Chris Young who was 3-6 and drove in a career-high five runs, which included a grand slam in the third inning to left field that drove in Mark Teixeira, Alex Rodriguez and Brett Gardner. Young also hit a double to left in the sixth to score Gardner to make the score 17-5. The Yankees had 19 hits, 10 walks and six different Yankees had multiple RBIs. In the second inning, Chase Headley hit two RBI singles, Brendan Ryan hit one double that could have been a double play that turned into two RBIs and another RBI double, Didi Gregorius hit a triple that scored Rodriguez, Young and Headley and Jacoby Ellsbury, Gardner and Rodriguez all hit RBI singles. Young’s 12th homer of the season made it 15-5 in the third and then in the fourth inning Young grounded into a fielder’s choice to score Gardner. Young is one of six Yankees with double digit homers. After Young’s RBI double in the sixth, John Ryan Murphy hit a single to score Young and Garrett Jones to become the eighth Yankee to drive in a run. For the Yankees final runs of the game, Gardner hit a two-run homer in the ninth inning off of infielder Adam Rosales, who was pitching for the second time this season. Equally as important as the offense was the Diego Moreno, who was called-up earlier in the day from Triple-A Scranton, came on in relief of Capuano to pitch 5.1 innings while striking out five, not allowing a hit and only throwing 70 pitches. He was able to save Girardi from having to use many relievers and proved to be more valuable than Capuano for the major league roster. Adam Warren did not allow a hit in his three innings after Moreno came out of the game. According to Elias, it was the first time that the Yankees bullpen had ever thrown seven or more hitless innings in a game. Gregorius has really gotten better at the plate during the last week. On July 22 he had a .234 average and he now has a .257 average. After his 4-5 game on Tuesday he is hitting .600 in his last five games with 10 RBIs and he has a and a solid .297 average (52-175) in 51 games since May 29. He has really improved offensively and defensively since the beginning of the season and appears to be a very capable starting shortstop. He has also added a hitter at the bottom of the lineup who has been getting on base and driving in runs, which makes the batting order that much deeper. The 16-5 record in July that the Yankees have is the best record this month in the majors. As the trade deadline approaches, the Yankees have a 7 game lead over the Orioles and a 7.5 game lead over the Tampa Bay Rays in the AL East. Masahiro Tanaka will get the start for the Yankees in Game 3 of the series Wednesday night at 8:05 p.m. EST. Chris Young in September of 2014. The Yankees (40-34), who were led by Houston-area natives Chris Young and Nathan Eovaldi, were able to even their series in Houston on Friday night with their 3-2 win over the Astros (43-33). With the Yankees losing 2-0 in the seventh inning, Young hit a three-run homer off of Will Harris over the 19-foot wall in left field at Minute Maid Park to give the visitors a 3-2 lead. Young’s game-winning homer, which was his ninth of the season, drove in Carlos Beltran and Garrett Jones. He is from Houston and always enjoys playing at Minute Park based on how well he plays and that his friends and family can watch him person. Young said after the game that he left 50 tickets for friends and family to attend the game. He began his career back in 2006 and has been playing games as a visitor in Houston ever since. In 105 at-bats at Minute Maid Park he has hit nine homers with a remarkable .409 average. Young, who struggled in May after his hot start to the season, is on a nine-game hitting streak with four consecutive multi-hit games to raise his average to .271. He has been playing very well the previous seven games with Jacoby Ellsbury still on the disabled list and if he continues hitting like this he will deserve to split time with Beltran when Ellsbury returns. “To be able to do it in front of your family, your home town, and the city you grew up coming to baseball games in and now you’re one of the players on the field, it’s a little special for me,” Young said. The Yankees were only 1-5 with runners in scoring position, but Young came through when it counted as he hit his third homer in June. Eovaldi (7-2, 4.81 ERA) is from nearby Alvin, Texas, which is well known as the hometown of Hall of Famer Nolan Ryan. Eovaldi looked up to Ryan growing up and said that he didn’t know that the all-time leader in strikeouts was sitting behind home plate until the fifth inning. “Growing up, for me, I connected baseball with him,” Eovaldi said of Ryan. He allowed two earned runs in six innings and this was his second consecutive start limiting the opposition to two runs scored. This means that he has bounced back very well from allowing nine runs in two thirds of an inning to the Miami Marlins on June 16. He has improved his stuff and has kept hitters off balance a lot more in his last two starts since he has allowed five and three hits respectively in his last two starts after allowing a combined 17 hits in his previous two starts. “Tonight I was just trying to take it pitch by pitch,” Eovaldi said. According to the Yankees PR Department and Fangraphs, Eovaldi’s fastball has the highest average velocity (95.9) in the Majors this season. He can be an effective starter when he locates his secondary pitches and throws his fastball at the right time, but he just needs to avoid starts when he completely loses his command. After Eovaldi was taken out of the game after throwing 100 pitches, Chasen Shreve, Justin Wilson and Dellin Betances combined to throw three innings and not allow a hit. Shreve, who has not allowed a run in his last 13 games to lower his ERA to an impressive 1.76, had three strikeouts in his inning pitched, and Betances struck out two of the four batters he faced. After winning the game on Friday in Houston with big contributions from hometown players, the Yankees will play the Astros at 4:10 EST and will try for their first winning streak since they won straight from June 17-20. Masahiro Tanaka will make his first start against the Astros and will hit for the second game this season. Chris Young playing for the Yankees last season. 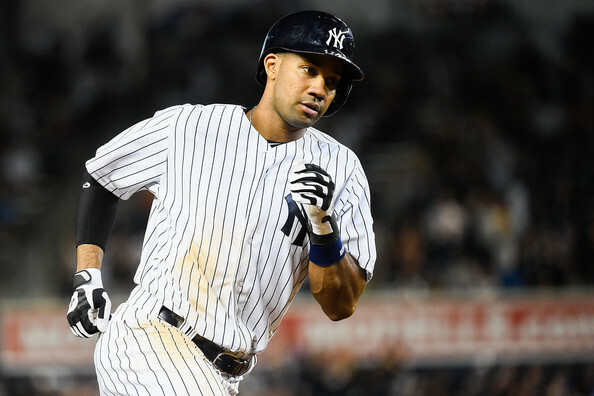 On Sunday, the Yankees signed the 31-year-old outfielder Chris Young to a one-year contract that is worth $2.5 million. He will be able to make $3,825,000 more in performance bonuses based on plate appearances. He will earn $200,000 for 275 at-bats, $300,000 for 300 at-bats, $350,000 for 350 at-bats, 375,000 each for 375 and 400 and $475,000 for 450 plate appearances. Young hit a combined .222 with 11 homers and 38 RBIs last season with the Mets and Yankees. However, in 23 games after being signed by the Yankees to a minor league contract on August 27, Young hit .282, with three homers, eight doubles and 10 RBIs. The eight doubles were only four fewer than he hit in 88 games with the Mets. His month with the Yankees included hitting a homer in three straight games and stealing home. He is a career .234 hitter with 155 homers, 486 RBIs and 130 steals. In 2010, when he was an NL All-Star while playing in his fourth of seven seasons with the Arizona Diamondbacks, he hit .257 with 27 homers, 91 RBIs, 28 steals and 33 doubles. The Houston native will be the team’s fourth outfielder and was worth bringing back because if he can play the way he did in September he will give the Yankees a player off of the bench that the didn’t have in 2014. In 2014, Ichiro Suzuki was the number four outfielder (and sometimes starter) and wasn’t able to supply the power numbers that Young will be able to. Ichiro’s .340 slugging percentage last season was the lowest among any Yankee outfielder with at least 300 plate appearances since Bill Robinson had a .281 slugging percentage in 1967. Ichiro had a solid .284 average last season, but only had one homer, 13 doubles and 22 RBIs. Young had eight doubles in only 23 games. General Manager Brian Cashman had help from his analytical department in signing Chris Young and the signing was able to finalize the outfield for the 2015 season. 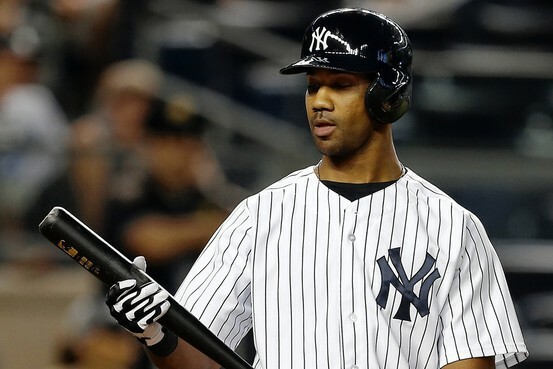 He will be the fourth outfielder behind Carlos Beltran, Brett Gardner and Jacoby Ellsbury. Young can play all three outfield positions, has a career .990 fielding percentage and when he is on he has a solid combo of speed and power. He adjusted well to his move from Queens to the Bronx and should be able to fill in if an injury happens. The Yankees just need him to play like he did in September and not like he did the previous five months. He also allows the Yankees to get younger because he is 31 and has played eight MLB seasons while Ichiro is 41 and has played 14 MLB seasons after coming over from Japan. The Yankees snapped their two-game losing streak with a come from behind 8-5 win over the Tampa Bay Rays on Wednesday night. This win was their 35th win of the come from behind variety this season. Chris Capuano allowed four runs in the first inning and was taken out of the game by Joe Girardi after only getting one out. Six out of the seven hitters he faced had either a hit or a walk, which included Logan Forsythe’s single that scored Wil Myers. Ryan Hanigan’s sacrifice fly that scored James Loney came with Chase Whitely pitching, but that run was charged to Capuano. He did not have his stuff on Wednesday, but the bullpen did because five pitchers combined to allow allow one run in 8.2 innings. The offense did their part in this game as well. The Yankees were an improved 3-9 with runners in scoring position and two of their nine hits were home runs. Wednesday’s game was the second time that they had scored more than three runs in their last five games. Brian McCann hit his 18th homer of the season in the bottom of the first to put the Yankees on the scoreboard. McCann drove in the team’s second and third runs in the third inning with his single that scored Chris Young and Jacoby Ellsbury. 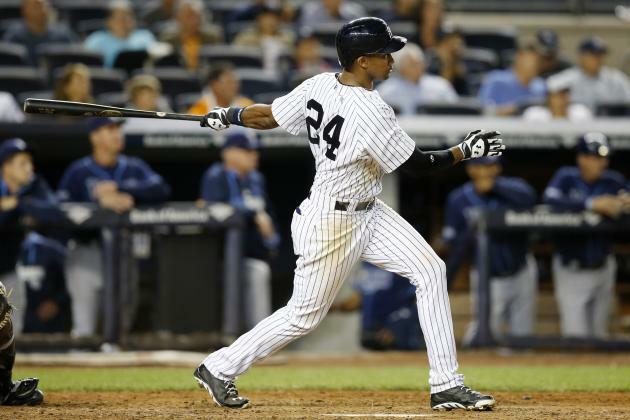 The Yankees tied the game at four in the fourth with Young’s first homer with the Yankees. Young had only one three-hit game in 88 games with the Mets this season. He had his first 3-hit game in his fifth game tonight with the Yankees. Mark Teixeira‘s unlikely triple in the fifth inning scored McCann to give the Yankees a 5-4 lead. Chase Headley, who was 2-3, hit a single off of relief pitcher Jeff Beliveau to drive in Teixeira. That run was the sixth charged to Rays started Jake Odorizzi. The Yankees tacked on two insurance runs in the eighth inning with a run scoring double by Ichiro Suzuki and then a double to left by Young that scored Ichiro. Evan Longoria smashed a homer off of Esmil Rogers in the ninth to make the score 8-5. Rogers would rebound to get Myers to pop out to Stephen Drew at second to end the game. The last time that the Yankees scored eight runs in a game was on August 27 when they beat the Detroit Tigers 8-4. The Yankees have 19 games left in the regular season and are currently 4.5 games out of the second wild card spot, as a result of losses by both the Mariners and Tigers. The Yankees will likely have to win 15 or more games the rest of the season to have a chance.